Boston is magical during the holidays, with Back Bay streets lined with festive lights, Faneuil Hall's Christmas tree glitters with hundreds of ornaments, and Beacon Hill's cobblestone streets glisten under a soft dusting of snow. Yet despite all of its Christmastime wonders, Boston also offers merry-goers a chance to de-stress and unwind from the hectic holiday season. Checkout these holiday hotspots that's sure to keep you warm and jolly this Christmastime. XV Beacon Hotel Ranked by Travel+Leisure as one of the best hotels in the Northeast, this stunning and luxurious hotel offers some holiday cheer in the form of discounted packages for couples during Christmastime. Their holiday getaway package includes an intimate Christmas eve dinner spread right in the convenience of your own suite. Hotel Marlowe Let Orchard House be your rustic rescue away from it all this holiday season. Although modern, this quaint little boutique hotel offers individuals the chance to be with somewhere "off the beaten path", even if it's just across the Charles. Part of the Kimpton Hotel Group, Hotel Marlowe offers holiday rates that will surely make your days with them merry. Blink! Experience Christmas lights dancing to the tune of the Boston Pop's popular holiday sounds. 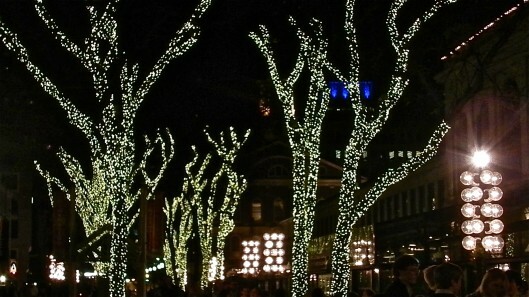 With over 350,000 decorated LED lights, this free to all show at Faneuil Hall has "screenings" every half hour past 5PM, beginning November 17 until January 2nd. Boston Common Tree Lighting A tradition that spans more than 70 years, Boston's mayor officially ignites the lights of the Common's Christmas tree and the park's sprawling grounds. The tree, a yearly gift from the city's friends in Nova Scotia, will be lit this year on Thursday, November 29 at 7PM.